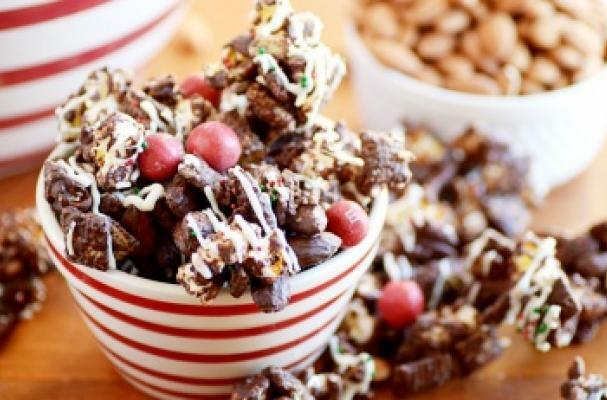 Reindeer chow is the perfect Christmas snack food. Kids and adults alike will love the combination of sweet, salty, smooth and crunchy that this snack offers. Kettle corn is mixed with rice chex before being tossed with melted chocolate and studded with salted nuts, candy coated chocolate candies and dried fruit. You can mix and match your mix-ins to suit your family's taste. Sometimes I like to use caramel coated chex for some extra sweetness. Step 1: Pour the kettle corn and cereal into a large bowl. Step 2: Melt the chocolate according to the directions on the package. Once melted and smooth, pour over the cereal and kettle corn. Use a large rubber spatula to gently stir and coat everything well. Step 3: Add the almonds to the bowl and gently stir to coat. Step 4: Spread mixture on a large nonstick surface (like silicone baking mat or parchment paper) to cool and harden (approximately 10 – 20 minutes). Step 5: If desired, drizzle with melted white chocolate and top with M&M’s and sprinkles. Step 6: Break into pieces for serving or packaging into gifts.